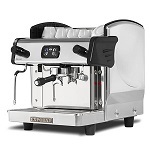 An espresso machine is the classic symbol of coffee enjoyment. The following machines operate by an automatic process of forcing pressurized water through a measure of ground coffee and a filter, producing a rich, concentrated coffee called espresso. All of these models are guaranteed to produce a authentic, luxurious espresso with maximum flavour.